Earlier this morning I set out to write a one-paragraph review of this logo. It’s 10:15 p.m., I’m missing the Oscars, I have nearly 20 tabs open in Safari, and I’m just now finishing to unravel the epic evolution that involved one reputable sports logo firm, a few hundred designers (and non-designers surely), a contest, and, of course, a committee. In 18 months. Ready? The story starts when South Dakota State University (SDSU) started to transition into the Division I of athletic competition in 2004, but it only starts to really unspool in October of 2005 when the athletic director noticed how bad its logo was in comparison to the other slick logos of DI schools. So they enlisted New York-based Phoenix Design Works (PDW) to tackle the challenge — but not before asking another firm to do “some preliminary designs”, whatever that means — with the goal to unveil a new design in February of 2007. From what I gather PDW started working on the logo somewhere in late 2006. In October of that year, PDW showed up to SDSU to present 30 design options, and as a response, the committee “took the representatives north of campus to watch jackrabbits running” hoping that this experience “would help them design a jackrabbit that fits SDSU better,” because, “their previous exposure to jackrabbits was online photos.” This should tell you enough about the process. The committee is never quite revealed, but there are members from the Student Association, as well as a Relations Director, and I’m guessing members of the athletic program, but as the story continues, they sound like a designer’s worst nightmare. In January of 2007, PDW shows up with a proposed solution, which is only seen in a little sidebar on this page, that involves a more realistic rabbit. From what I can see it does seem odd for a DI school, it looked like more of a Velveteen rabbit. The committee was not happy, specially as they garnered responses from people in the university. Including, god knows why, Derek Peterson the university’s bookstore manager, who “[had] been somewhat frustrated because he asked to see the logo in different colors and sizes, but the design committee failed to meet those requests”. So, no logo yet, and back to the drawing board. 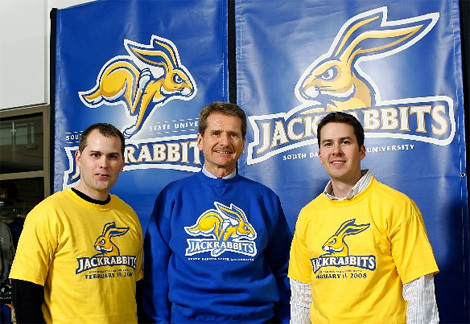 In February, when the logo was supposed to be released, a turning point came when Ross Hettinger, a junior art education major, who “spent six hours coming up with his own versions of the logo with his idea of true jackrabbit characteristics” and posted it on Facebook to share his work with students. The group grew to 400 members, with some suggesting logos themselves, giving the committee a glimpse at the power of crowdsourcing. Do you have shivers yet? Hold on, it gets better. During the Feb. 7 meeting, Brandtjen said she showed committee members student designs that were given to her, as well as designs that were posted on a group on Facebook, a social networking Web site. In this Stephen King-worthy article, the fee paid to PDW is also revealed: A whopping $6,000. Six. Thousand. Dollars. For a Division I athletic logo? That’s low. Specially for a process like this. Sometime in April, the logo unveiling is moved to Fall of 2007, while PDW is subjected to whatever feedback may have spawned from the committee as well as the looming potential of more logo submissions from yahoos around the country. By the end of Spring of 2007, after PDW submitted three more designs, to mixed reactions, SDSU decided to offer a less-than-whopping $1,000 as reward to anyone that came up with the winning design of a contest ending June 30 — and by “anyone” they really meant it, as “those who submitted designs ranged from a 14-year-old to an 89-year-old alumnus.” After a reported 250-plus submissions, the committee selected around five logos and asked their designers for revisions less than a month later. After focus groups and online surveys a logo was submitted to the university’s administration in December of 2007 for approval. The winning design was unveiled this past February 19. Craig (left) and Cory Whitlock (right) of Mongoose Graphics in Denver, winners of the contest. The new design is exactly what you expect a sports logo to look like nowadays: Fierce. It is actually quite handsome when you judge it within the context of sports logos. The winning design came from brothers Craig and Cory Whitlock of Mongoose Graphics in Denver, who designed the two logos shown above. However, if I understand correctly, the “jacks” typography with ears and fluffy tail shown at the top of this post, was designed by someone else, a Tony Horning of Minneapolis. You can see some flashier pictures here, if you don’t mind a little watermarking. So, there you have it kids, that’s how you design a logo in 2008. It’s not too late to change careers. Send a bucket of roses to Phoenix Design Works if you like, they surely deserve it. The old Jackrabbit was created in 1971 by Larry Westall of University Relations. Its resemblance to Bugs Bunny may also have played a role in their need for change. Thanks to Rusty Mitchell for the tip. \n\nEarlier this morning I set out to write a one-paragraph review of this logo. It's 10:15 p.m., I'm missing the Oscars, I have nearly 20 tabs open in Safari, and I'm just now finishing to unravel the epic evolution that involved one reputable sports logo firm, a few hundred designers (and non-designers surely), a contest, and, of course, a committee. In 18 months. Ready? The story starts when South Dakota State University (SDSU) started to transition into the Division I of athletic competition in 2004, but it only starts to really unspool in October of 2005 when the athletic director noticed how bad its logo was in comparison to the other slick logos of DI schools. So they enlisted New York-based Phoenix Design Works (PDW) to tackle the challenge — but not before asking another firm to do \"some preliminary designs\", whatever that means — with the goal to unveil a new design in February of 2007. From what I gather PDW started working on the logo somewhere in late 2006. In October of that year, PDW showed up to SDSU to present 30 design options, and as a response, the committee \"took the representatives north of campus to watch jackrabbits running\" hoping that this experience \"would help them design a jackrabbit that fits SDSU better,\" because, \"their previous exposure to jackrabbits was online photos.\" This should tell you enough about the process.